Take wheat flour. Add salt and oil and knead it for parathas. Take frying pan. Add oil, put green chillies, shredded cabbage into the oil and cook it for some time. Add salt to it so that it cooks fast. Make sure that it is not overcooked. Let it be slightly raw. Now make small balls from dough. Roll paratha and put the stuffing into the centre. Fold it from all four sides to make it a square. 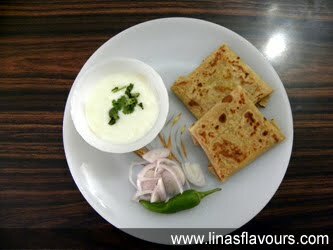 Take a tawa and put the paratha on it and cook it on both the sides smearing it with oil. Serve it hot with curd and onions.